Breakfast with a few Best Friend's Dogs (and owners) July 11th, Wantagh NY. Notice the untouched eggs, bacon, and french toast on plates in front of the dogs. "In Home" Basic Obedience is our original Lifetime program, and if you have the time, works great. In "One on One" Basic Obedience, a trainer will work with you One on One and teach you how to train your dog. At the end of this phase your dog will know Sit, Stay, Come, Heel, Down, Off, Leave it, and Place, both on leash and off leash. Your dog will follow all these commands during distractions and without food bribes. When in heel (walk next to me) your dog will happily pay attention to which directions you choose to walk and stay with you. During Basic Obedience you will never hit or yell at your dog. All attention getting techniques are done at vey low levels and copious amounts of praise and love will be used to reinforce wanted behavior. We've found that most people need to practice about 25 minutes a day, every day to get the off-leash result both in and out of your home. This is a "Lifetime" dog training program and all lifetime clients are welcome to our weekly group classes FREE for the lifetime of their dog. A dog must be at least 4 months old to start this phase of training and we usually accomplish these goals in 4-5 private lessons. We get calls all the time from people who said their dog had "failed" obedience school or were "asked to leave". The problem usually is not the dog but what the other school failed to successfully teach the owner. This is a shame and a waste of money. Best Friend's Dog TrainingÂ® understands that telling someone to "do this"is not good enough. You need to understand why you are doing something. We know it takes some people longer then others to understand what is being taught. That's why we offer One Price for the Life of the Dog. This program requires a free evaluation so you and ask us all the questions you want and there are no surprises. We can provide pricing for this program at the evaluation. A 2 week boarding program that is followed up with private lessons in your home. Over the years, this program has exploded in popularity and is our most referred program from existing clients to their friends and family. Most people who choose Board and Train either have little time to train their dog, are going away on vacation, are pregnant, or their dog is physically stronger then they are, and they need their dog trained. Although the owners still need to maintain training, this program requires less effort than the "At Home" program. Learn more about our how our two board and train dog program works. Board and Train is a "Lifetime" program and all clients are welcome to our weekly group classes FREE for the lifetime of their dog. A dog must be at least 4 months old to start this phase of training, and be up to date with all vaccines. 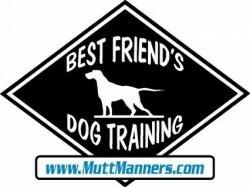 All In-Home and Board and Train classes include a "Lifetime" membership to the Best Friend's Dog Training Community. The "Lifetime" membership is for the life of your dog and provides unlimited follow-up group classes, annual picnics and parties for dogs, as well as receiving a discount on boarding. These programs are offered as both Leash Based Programs and Off Leash based Programs. Full program descriptions and prices can be determined when we understand all of your needs at the Free Evlauation. Puppy Kindergarten - a great start! Puppy Kindergarten & Puppy Group Class in Levittown and Massapequa. Puppies have different needs and expectations then older dogs. The impressions we make on a pup will affect the pup for life, as such, we will teach puppies using positive only reinforcement and if you choose, clickers. We spend the time with you teaching what to do and what not to do. We will actively teach topics in a 5 week group setting such as housebreaking, crate training, socialization, teaching basic commands, and how to effectively communicate with the pup. It is very important to understand that this program does not, and can not replace actual obedience training needed after 4 months of age. The pup must be less than 18 weeks to attend this class. Please click on the Puppy Kindergarten Link for more information or to sign up.